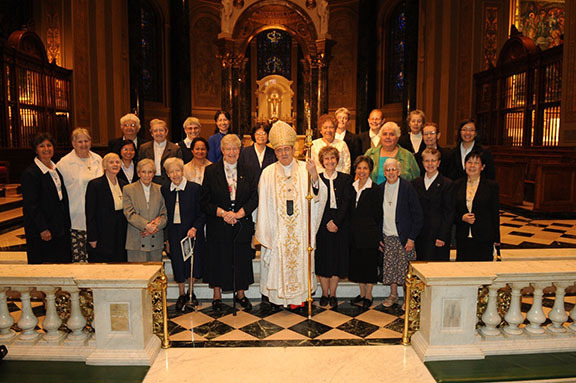 The Handmaids of the Sacred Heart of Jesus is an international community of Roman Catholic women of all ages, races, and cultural backgrounds. Today, as in the first days of the Congregation, the Handmaids strive to be true servants of the Sacred Heart of Jesus by being agents of Reconciliation. As women of prayer, we depend on the “daily bread” of Eucharist, and find the fuel of our ministries through Adoration of the Blessed Sacrament and a rich community prayer life. We are inspired women. We are inspired by our Foundress, Saint Raphaela Mary, who answered God’s call generously and began our congregation in the 1870’s and 1880’s. Since then we have been drawn by a common call to give our lives completely to Jesus Christ, His Church, and His people in a life of joyful chastity, poverty, and obedience. We are prayerful women, energized for ministry through daily celebration of the Eucharist and adoration of the Blessed Sacrament and in a rich community prayer life. We are active women. Our active ministry of education (both in and beyond the school setting) is “an encounter with God which transforms us into contemplatives in action.” (Constitutions 9). We are Christ Centered women. We truly want Jesus Christ to be the center of our life and love. In following Him we discover that it makes perfect sense today to be consecrated women in the world and for the world. We are radical women. We are convinced that the radical living of this consecration is a source of joy and fruitfulness.